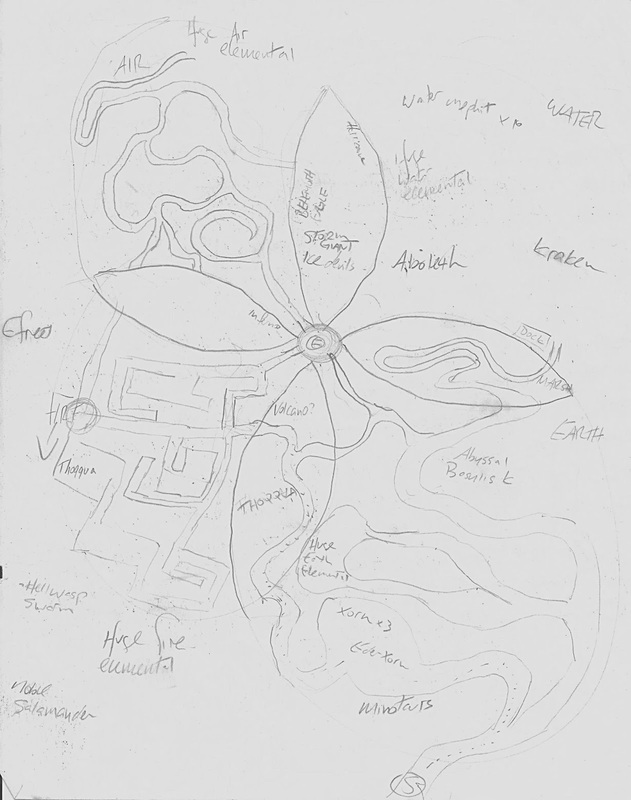 This absolutely insane map was designed by Elijah for Maze of the Minotaur Game 8. In it Dave and I were tasked to travel the planes of Earth, Fire, Water, and Air in order to bring a diplomat to negotiate with the Angels. The Minotaurs had broken free from their labyrinths and begun their war against mankind, and we needed the Angels help. This was hands down the largest dungeon we have crawled through in JADE's Maze of the Minotaur Campaign, taking us a full 5 games to complete. The flower like structure represents a nexus between the the realms, and needless to say we got lost many times trying to find our way towards the city of the Angels. It was a long haul but we pushed through!